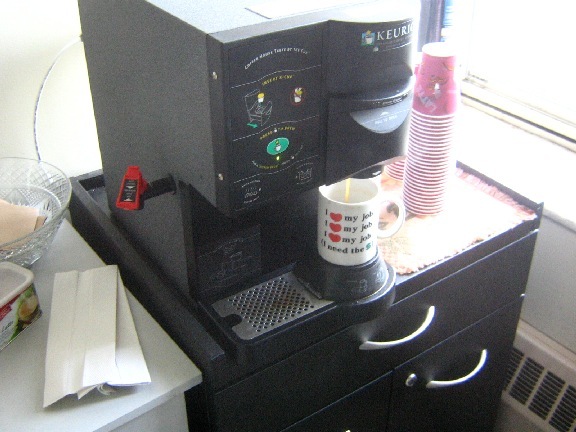 I'm in a bit of a rush, as I spent most of the morning cleaning up the kitchen after Easter dinner. Now I've got to shower and get outta the house in time to catch the 7:47 R3 to Swarthmore. 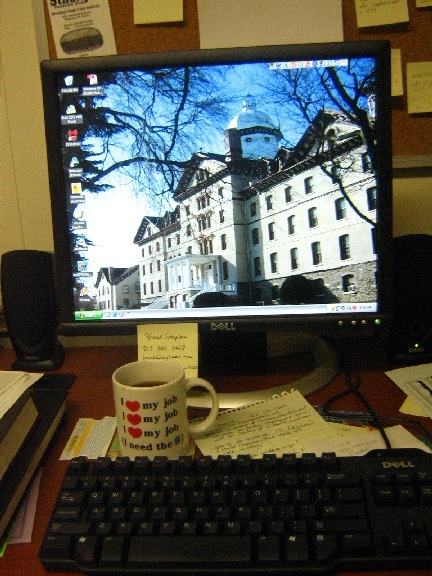 I'll catch up with all of you once I'm settled in the office. Oh, Yum! Cheesesteaks coming up? nice! do us proud, sandy! Excellent! Show everyone what we've got Sandy! This is going to be fun. looking forward to seeing the inside of your fridge! Hey -- Any green bean casserole on the menu for this week? Okay, I'm all settled in and have most of the trivial stuff out of the way, so I can now do a proper introduction. First, before I go further, to my fellow Pennsylvanians: I hope I do you all proud. We are truly blessed to have wonderful foodstuffs close at hand--thanks in no small part to Lancaster County's bounty, may it never be paved over--and I hope to clue the larger world in on some of them in the course of this blog. I had originally intended to call this effort "A Mess of Good Eatin': A (City of Brotherly) Love Letter," and while you will all note that the title has changed, I hope that I can still share some of the love I have for this greatly underrated city and some of its culinary traditions. But I'm a working stiff with two jobs (one of them as a freelance contractor), a significant activity (which you will see a little of on Wednesday) and a lot of balls/bills to juggle. So I suspect that what is more likely to come out of this effort is A Week In The Life of a Slapdash Food Lover, with some extras thrown in. By virtue of where I work, you will now find out more than you ever cared to know about dining in Chester, a largely derelict little industrial city of some 38,000 souls about 15 miles southwest of Center City Philadelphia, where I live. I've already talked two of my co-workers into coming along with me for the ride at lunchtime. One of the places we all want to visit is a restaurant in the city's West End that was launched by displaced New Orleanians in the wake of Hurricane Katrina. The opening of this place made the local TV news, and the owners serve up authentic NO fare. I anticipate that my meal will be even more enjoyable than those served at the fancier New Orleans-style establishments in town, if for no other reason than that it will be prepared by people who really know the cuisine. 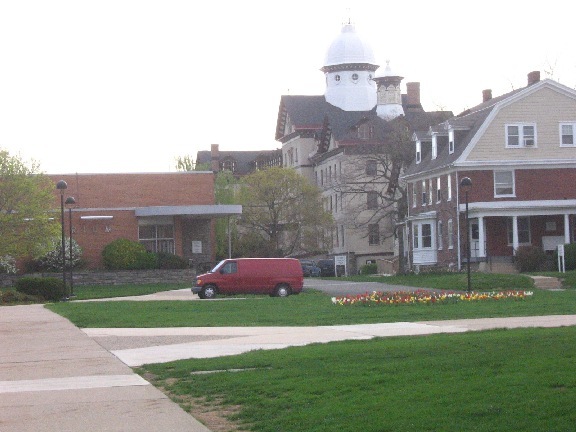 You will also get a glimpse at institutional dining, for while my employer is located in the nice part of Chester, the dining options around the Widener campus are limited. As compensation, though, you will share with me lunch served by tomorrow's restaurateurs, chefs and hoteliers--students in Widener's School of Hospitality Management, who serve lunch every Tuesday in the school's fully-equipped dining room (with liquor license). 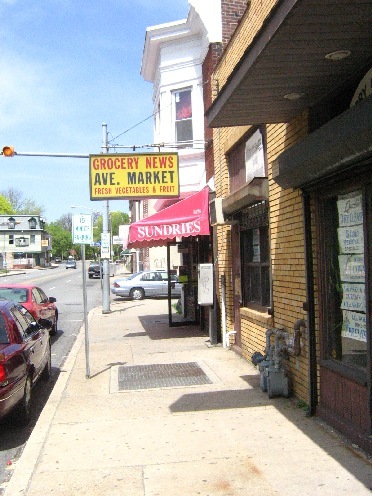 You will also learn something about shopping for food in Philadelphia. Rocky Balboa didn't stop to inspect the tomatoes on his run through the Italian Market, but if I get down there when it's open, I will. And I will definitely take you to "The Greatest Public Market in America," a treasure all good Philadelphians cherish. And my schedule willing, you will also join me and some of the other eGulleteers from this region as we embark on the first leg of a major undertaking: Revisiting all of the past winners in the pizza category of Philadelphia magazine's "Best of Philly" awards that are still in business. But since this is my life and week, I will also throw in some of my other passions. One of them, as you might have gathered from one of the teasers, is trains and trolleys. 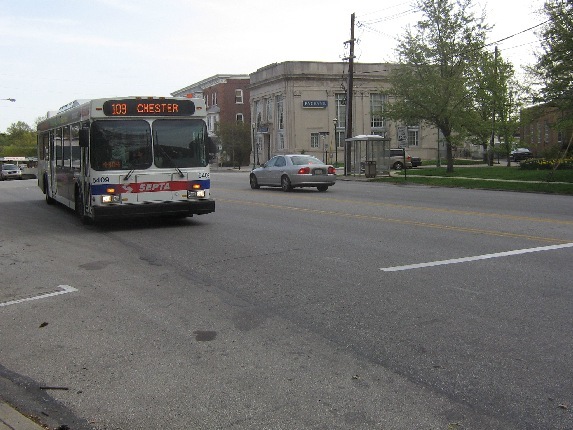 I rely on SEPTA to take me everywhere I want to go around town, and whenever possible, I will include directions by public transit to the places I visit. The question is: What is the significance of this structure in the history of American restaurants? Next up: My morning routine. I can't wait to see this blog unfold! 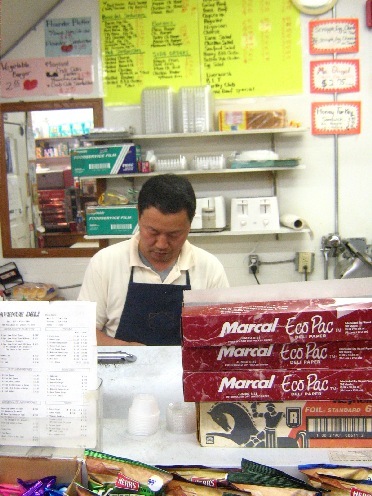 I have many happy memories of living and eating on the outskirts of Philadelphia . So here's what my typical weekday morning looks like. Replay these images in your head for the next four days, for like daytime television, little changes from day to day except the soap-opera storylines. 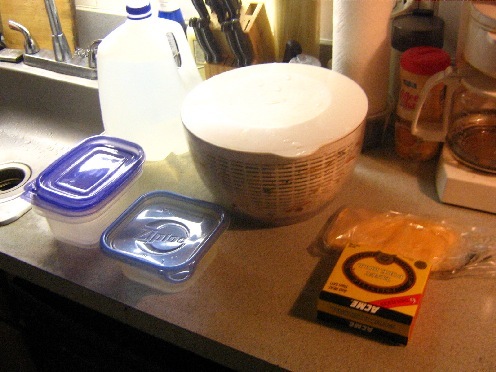 I usually arise at 6 a.m., go into the kitchen of my apartment and unload last night's load from the dishwasher. This usually takes about 15 minutes. However, today, I also had to finish cleaning up the leftover pots and pans from the dinner I fixed on Easter Sunday--most of which is now sitting in the fridge*, because just about everyone we invited ended up as no-shows--so I barely had time to prep lunch for my partner (a tossed salad and leftover "Pasta Jambalaya") and fix my own quick breakfast. The mixed salad in the spinner will last all week. 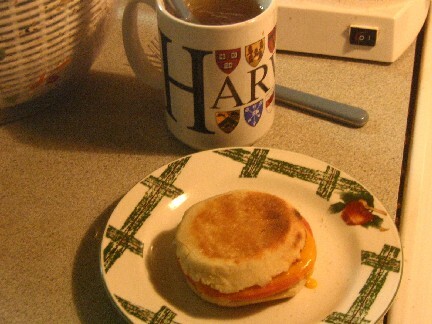 The other stuff that's out will go into my own breakfast sandwich: Pork roll and cheese on a toasted English muffin. I consume this with a mug of green tea with honey. 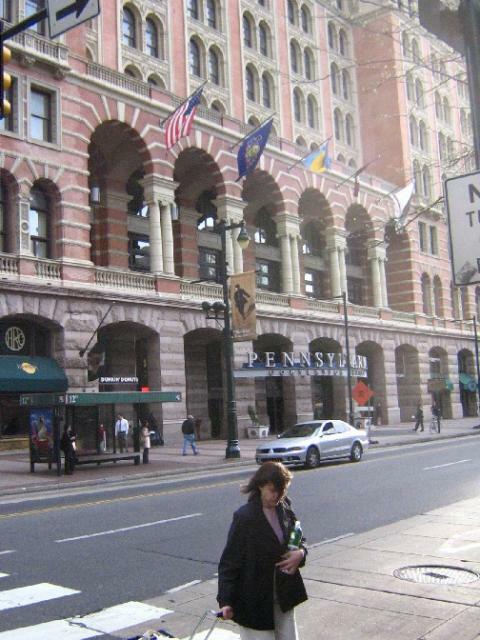 We will return to this structure over the weekend, for besides being a convention center, hotel and commuter train station, it is also home to the Reading Terminal Market, the city's finest fresh food emporium and the direct descendant of the public market stalls that gave Market Street its name. But right now my destination is Market East Station, one of the two underground hubs of Greater Philadelphia's regional rail network. That's my train--the 7:47 R3 to Elwyn, 2 minutes late--pulling into the station. ...and with mug in hand, I'm ready to face the new day. *To those of you who asked in advance: Yes, the fridge shot is coming. Real Soon Now. Edited to post higher-quality images. Me, too, Kathy.......although it has been 25 years ! Sandy! Philly! We LOVE Philly, and you! I second Chufi's post, show us your fridge, dearie. You've seen your share, it's your turn! For eGullet blogs, there ought'a be a law. See the last line in Post 12. I've not forgotten and will not shirk my duty. If you need any help with the GBC recipe, I'll hook a brotha' up. Sandy: You promised I could ask the Big Question, but Chufi beat me to it! 1) A special trip to the Italian grocers and merchants that you mention every so often. Lots of pictures and information, please, if so inclined. 2) You wrote about a former haunt of LWL. If there's anything there to show us, that would be nice, too. 3) A trip to the Swathmore cafeteria(s) or places students eat. Maybe snapshots of what they're buying to eat on the run or a few Man on the Street/Quad candid interviews about eating habits. Of course, the latter may not be a good idea given the nature of your job. However, in 2005 the NYT published an article about some college dining services and moves toward purchases from local farmers, promoting more healtful diets and/or responding to student demands for meals that fit their dietary preferences. etc. It would be interesting to see how your school relates to this trend. This Philly foodblog is great already. 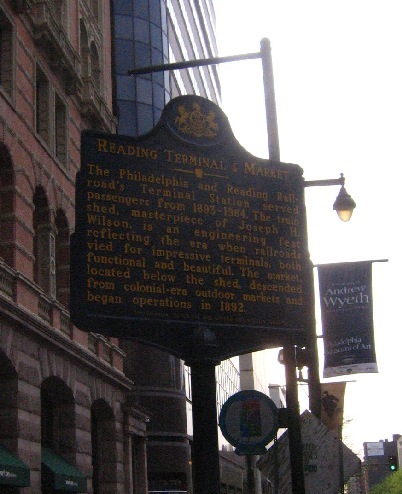 Philadelphia is one of my all-time favorite cities to visit, which I did much more often when I lived in Delaware. 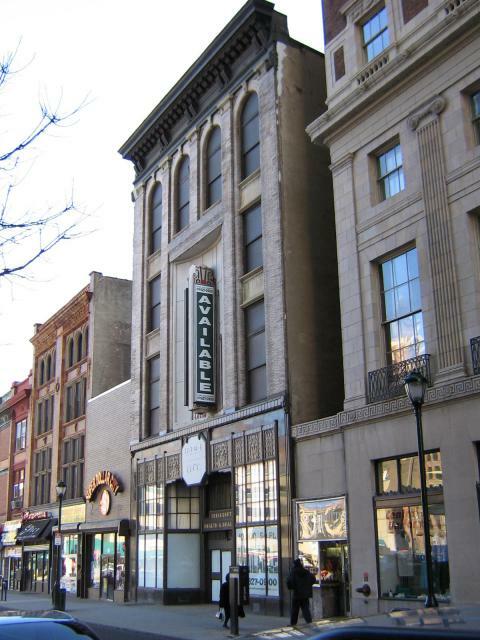 And, my father was born and raised in Chester, a city beloved by many (9th Street, Kerlin Street . . . what do they look like now?). My aunt lived in Swarthmore. Any chance you might buy a big fat, good, real Italian sub (or hoagie or whatever you call it), and show a picture of it? I'm more interested in seeing that than a cheesesteak. So many memories! I used to take the R3 from Swarthmore into the city. Many a quick meal over at The Village Restaurant - loved their macaroni and cheese. Ate at the Ingleneuk more times than I can remember as well. There was a really good casual sandwich/ice cream place close by that had a tuba hanging from the ceiling, but I just can't remember the name of it. Any idea what I'm talking about? 1) Definitely doable, though knowing me, it'll fall through the cracks of the weekend. 2) The Crystal Tea Room on the 9th floor of the Wanamaker Building is intact and used as a function hall. I don't know how easy it is to get up there after 6 or on weekends, but I'll nose around. 3) That's going to be a much taller order, as I work at Widener University, 10 minutes south of Swarthmore on Chester Road/Providence Avenue. I did take a stroll around Swarthmore's beautiful campus (which is also an arboretum) while killing time one afternoon waiting for the 5:55 R3 into Center City, and got a glimpse of their dining hall, which is a fabulous-looking facility dating (it appears) to the late 1970s. Our dining hall is nowhere near as stunning architecturally, nor has there been a groundswell of demand for fresher, healthier food among our students, at least none that I can detect. I do count two current students who I met off-campus in one of the gayborhood clubs among my acquaintances, and they have both complained about the quality of what Aramark dishes out on occasion. 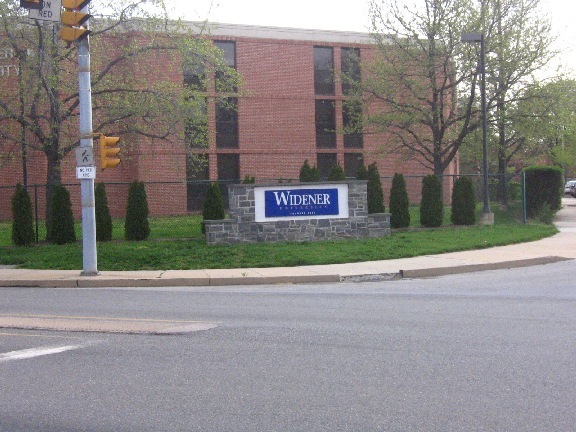 But--and this is not meant as a knock on Widener students, who so far have impressed me as a decent bunch--this school, with its military-academy heritage and mainly regional reputation, doesn't draw the sort of high-minded, socially conscious students who gravitate to Swarthmore from all over the country. The two schools now share more in common than they once did--both now make civic engagement a centerpiece of their academic mission--but at Swarthmore, that represents the continuation of a tradition, while at Widener it represents something of a completely new direction. Maybe as the service-learning ethos gets more firmly implanted here, we will attract more of the sort of students who would agitate for better dining hall fare instead of just gripe about it. We'll see. "What Chester Makes, Makes Chester": I'm awestruck by the level of affection oldtime Chesterites show for their onetime hometown. One of them is a co-worker, and one of the first things she did after my arrival is direct me to a great historical/nostalgia site, OldChesterPA.com, which is full of reminiscences of the Chester that is no longer. I've been on two car tours of the city, and while there are some still-solid neighborhoods (mostly north of I-95) and hopeful signs for the future, the years have not been kind to most of the city. My trip home ordinarily takes me right down the former main shopping street, Avenue of the States (your dad may have known it as Edgmont Avenue), and I spent one Friday walking around the downtown (where I stumbled across a great soul food place that I hope to share with you this week). It's really sad to see this once-bustling district with just about all the life sucked out of it. I'll add that to my to-do list for the week. I'm usually a brown-bagger at lunchtime, but since I'm taking all of you on a tour this week, I'm partially suspending my usual routine here. operated by a Chinese family, as are so many convenience stores in less affluent communities, it seems. 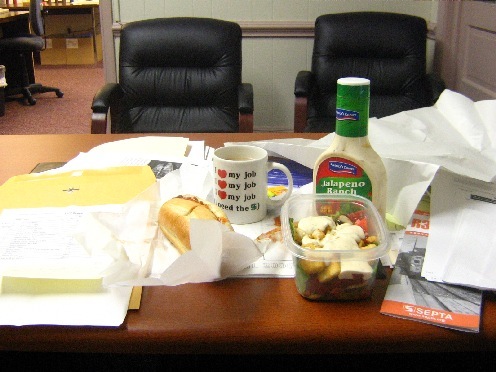 I usually pack a salad for lunch every day. It's a token step towards a little more balance in my cheese-laden diet. Someday soon, I will bring gym clothes to work with me and spend some lunch hours in our brand-spanking-new fitness center, which staff can use free of charge. I've been looking forward to this blog for some time, ever since the teaser in another blog a while back. It's amazing to me that you're able to take photos of your train and bus when they're pulling in and you're about to get on. I suspect most of us would be too busy gathering up our stuff and rushing off. And to think, when I blogged, I waited until I was on summer vacation. Right on, right on, right on! (or is it ride on?) Is SEPTA more of a commuter rail service and are you allowed to eat on board? I take the Metrolink system in Southern California and passengers are allowed to eat on those trains. 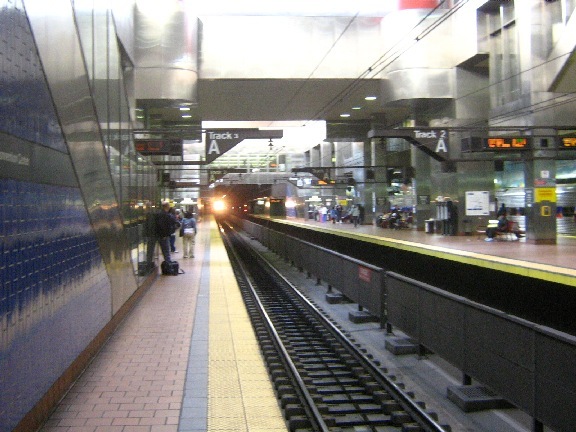 The Southeastern Pennsylvania Transportation Authority runs the whole show when it comes to mass transit on the Pennsylvania side of the Philadelphia metropolitan area--buses, subways, trolleys, commuter trains, you name it. 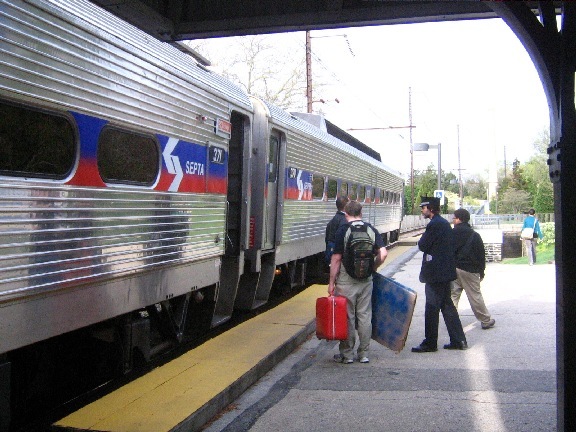 You aren't supposed to eat or drink on any SEPTA vehicle--not even the Regional Rail trains. This prohibition is honored in the breach often enough on all of them. That's an excellent question, one which I could spend some time answering. As it's getting late here, and I'm getting up early in the morning, please forgive me if I hold off on answering it until later.